On Tasting Table, an article about honeys and the honey pump, which will prevent you from making a sticky mess when you pull the honey out of the jar. I thought, what a great idea. But then, perhaps not. Artisanal honeys chrystallize, they become more or less solids. If they don’t christalize, they are an industrial products. I just went in the warehouse to check our five honeys made with religious fervor and taliban approach by Licu Manias in Sardegna. They are all solid, you can pump like there is no tomorrow… nothing will come out. 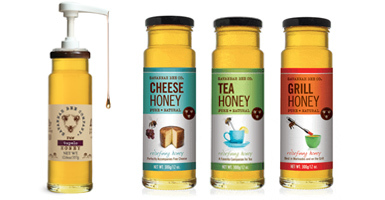 Pure and organic honey is still the best since it’s no preservatives added. Although the shelf life span maybe shorter compare to commercial honey, you can be sure that the nutrients are intact in it.